Tickets are priced by section in the auditorium. Tickets are available from the NAU Central Ticket Office at 928.523.5661. Please note that there is a $2 service charge added to ticket prices when purchased the night of the concert. 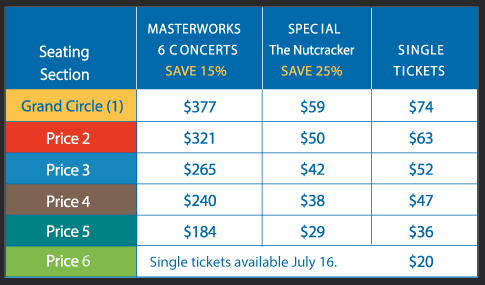 Hear all six Masterworks concerts and save with a discount of 15% off single ticket prices. Choose any 3, 4 or 5 concerts to create your own package and receive 10% off single ticket prices. Add The Nutcracker to any subscription package with a 25% discount off the single ticket price by including it in your purchase. Please note: The Nutcracker is not included in either subscription package. Save up to 15% off single ticket prices! 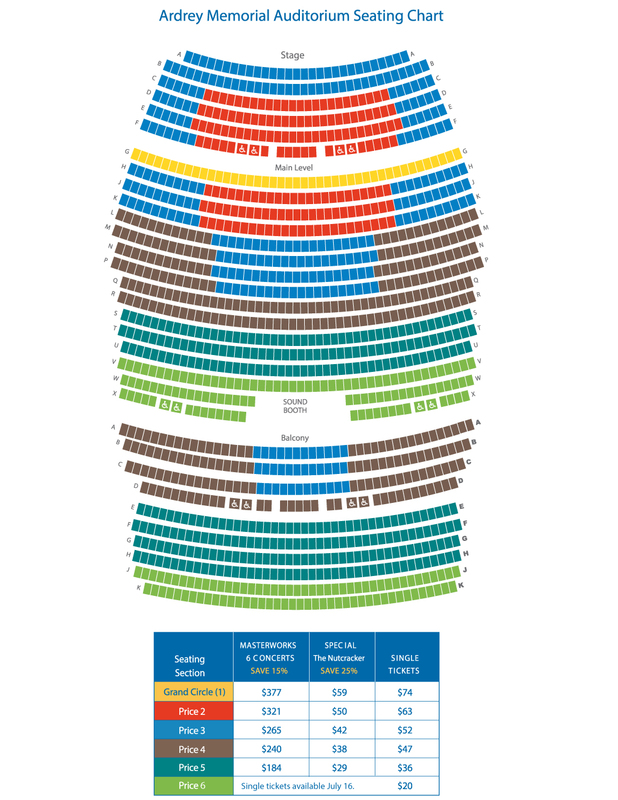 Priority seating – reserve the best seats. Add The Nutcracker with a 25% subscriber discount. Save 10% on any additional tickets purchased all season. Free replacement of misplaced tickets. Senior Rush Tickets: for those patrons who are 65 years of age and older, we offer $15 tickets in Price 5 seating. Seniors wishing to sit in other sections are given 50% off. *PLEASE NOTE: Senior discounts are only available during concert week. Concert week begins on the Monday before a concert. Student Rush Tickets: student tickets are $8 and sold only in Price 5 seating. Students wishing to sit in other sections are given 50% off. These tickets are available to students of any age from any school who present a valid I.D. *PLEASE NOTE: Student rush tickets are only available during concert week. Concert week begins on the Monday before a concert. Educators and Military Personnel: We offer $15 tickets in Price 5 seating to Educators and Military Personnel through the entire season. Those wishing to sit outside of the Price 5 seating area will be given 50% off. Please present valid I.D. when purchasing. Children: Children’s tickets include any seat in the house (excluding Price 6 tickets) at half price! The FSO encourages the cultural enrichment of our youth and gladly welcomes children (typically this means ages 7-17 but use your best judgement) accompanied by an adult. Big Brothers and Big Sisters of Flagstaff: If you are a BBBS of Flagstaff mentor please check with the local office for the discount code! Educational Groups: Educational groups receive a flat rate of $8 per ticket, whether for the child or the teacher/chaperone/leader. Teacher & Leaders wishing to bring students to a concert should contact the FSO office at 928.774.5107 before calling the NAU central ticketing office. Adult Groups: Those wishing to bring a group to a concert will receive a rate of $8 for children and $15 for adults. To qualify for this discount, a “group” will consist of a minimum of 10 people. One free ticket will be given to the group organizer! Please contact the FSO office at 928.774.5107 before calling the NAU central ticketing office. Become an angel and an advocate when you have tickets to a symphony concert but cannot attend. If you’ve tickets to a concert you are unable to use, on your behalf we will donate them to a child at Thomas Elementary School who might otherwise be unable to attend a symphony performance. We’ll let them know your name if you so choose, and we will send you a tax credit letter as well. Your ticket can give a child an introduction to the power and awe of a live concert. Contact the symphony office at 928.774.5107 for assistance.